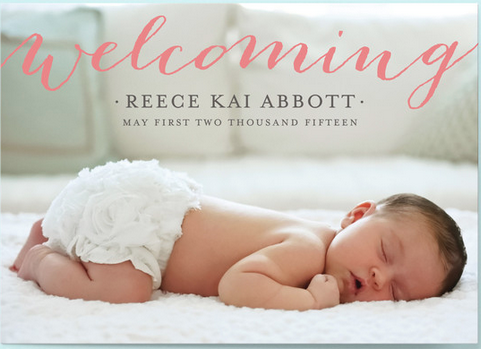 The Sweeping Name Birth Announcement by Alethea and Ruth was the design that we chose. The big scripty font across the front of the photo was what really caught my eye on this design. It's a clean and simple announcement, but having her name front and center like that added just enough drama. 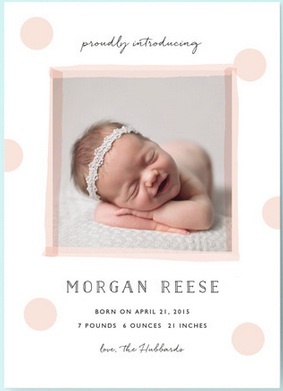 And how cute are her chubby newborn cheeks that photo?! Love! As I mentioned, Minted offers great options for customizing everything about your stationary order. This particular design was available in 5 different color motifs-- including a pretty Pebble gray and a vibrant Ocean blue. 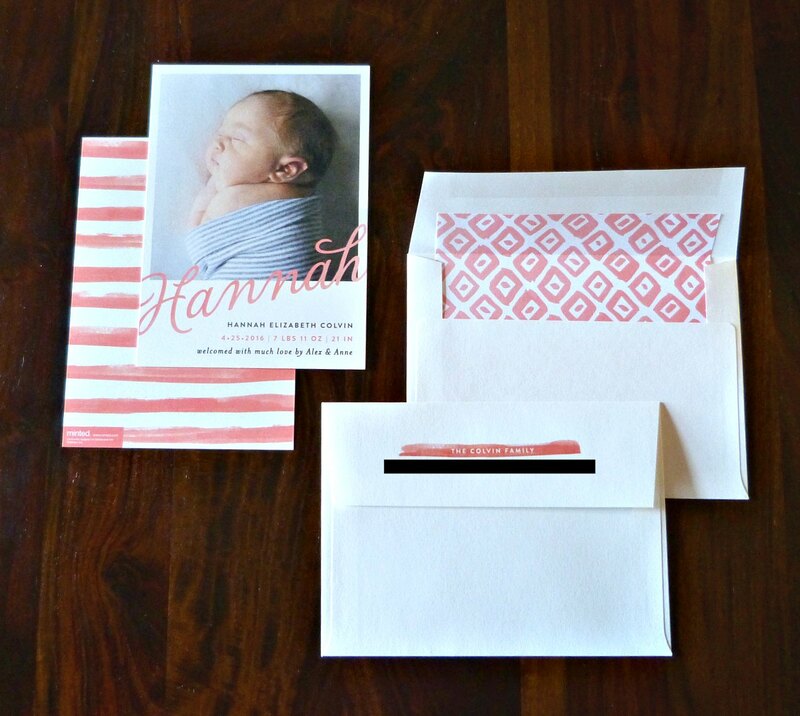 We customized the text with Hannah's vital stats and then I also selected this beautiful watercolor-esque stripe pattern for the backs of the announcements as well as envelope liners in a cute pattern, both in the coordinating Blossom color scheme. 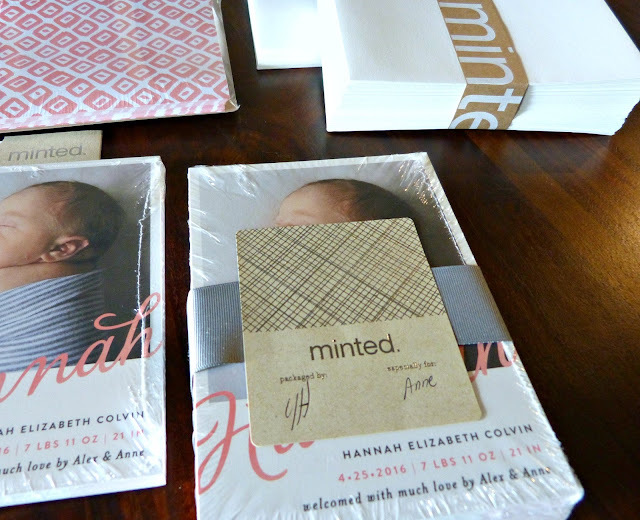 Minted will also include return addresses (edited out of this photo for privacy purposes) and if you're really organized, they can address all of your envelopes too. 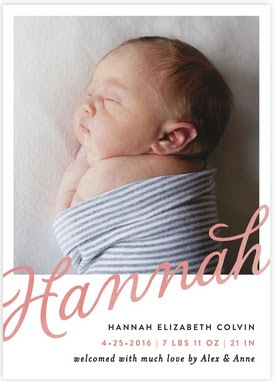 And one of the greatest things about Minted (which I have raved about before), is the personal touch and high level of customer service that they offer. 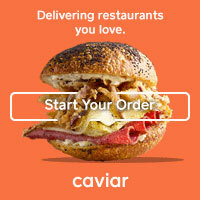 Any item that you're customizing will be sent to you as an email proof to check over before anything is printed and sent to you. And when everything arrives, it's adorably packaged and signed by the actual human being that packed it up for you! I loved the gingham print on this one! And it looks great in pink with a black and white photo. 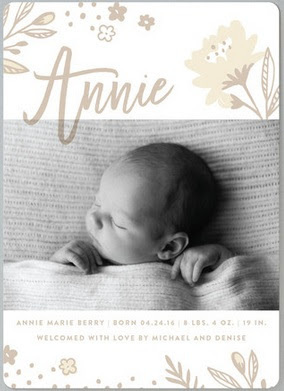 This one initially caught my eye because it's got my own name front and center, but I loved that it was modern, but whimsical and such a feminine design. Polka dots! Anything polka dot or stripe patterned is right up my alley. This one is simple and sweet. 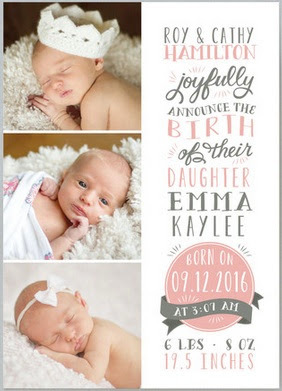 This option is great when you have tons of great newborn photos and can't choose just one! And I love the playful font design here-- and in my favorite pink and gray color scheme. Again, I love polka dots! 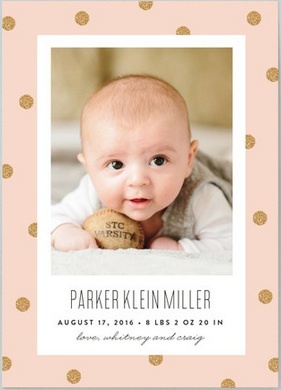 And I love that there's a little bling in this blush and gold color scheme too. 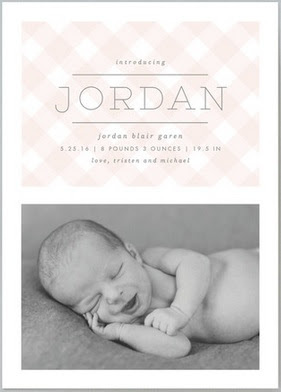 The photo is really the focal point on this one-- and how could it not be adorable with a picture of chubby little baby? This one also incorporates the big scripty font that I loved in the design that we ultimately chose. Editor's Note: Complimentary products were provided by Minted in order to facilitate this post. All opinions expressed here-- as always-- are my own. Thank you for supporting the brands that make A Squared possible! They really do have the best stuff!